additional wishes as a comment. Request denied: order processing is completed. 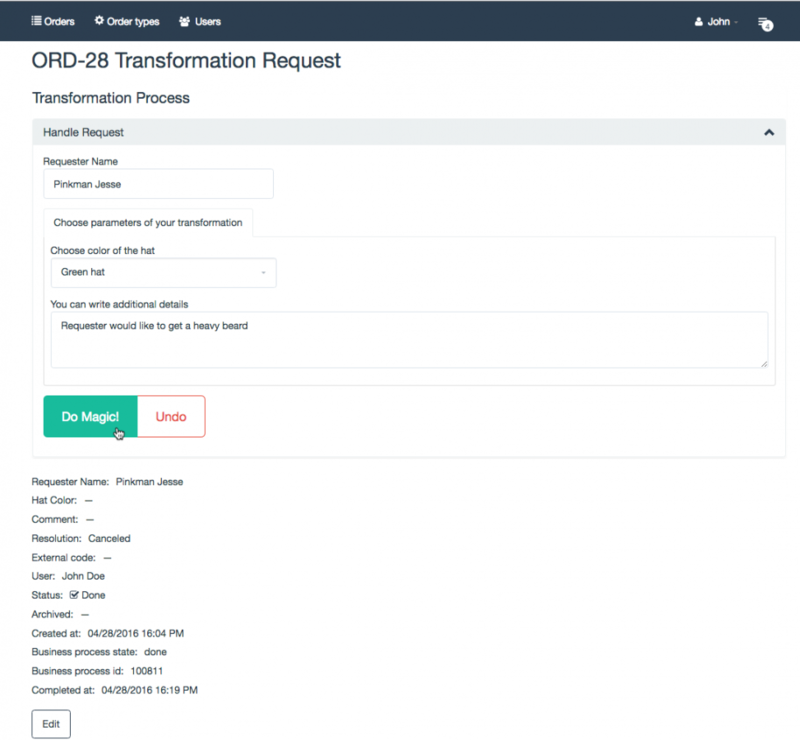 The order type code (transformation_request) and the name displayed in the interface (Transformation Request) are specified here. resolution — accepted or rejected. The system utilizes the pattern common for the field type (string) and determines the displayed name (label) for each field displayed on the interface. 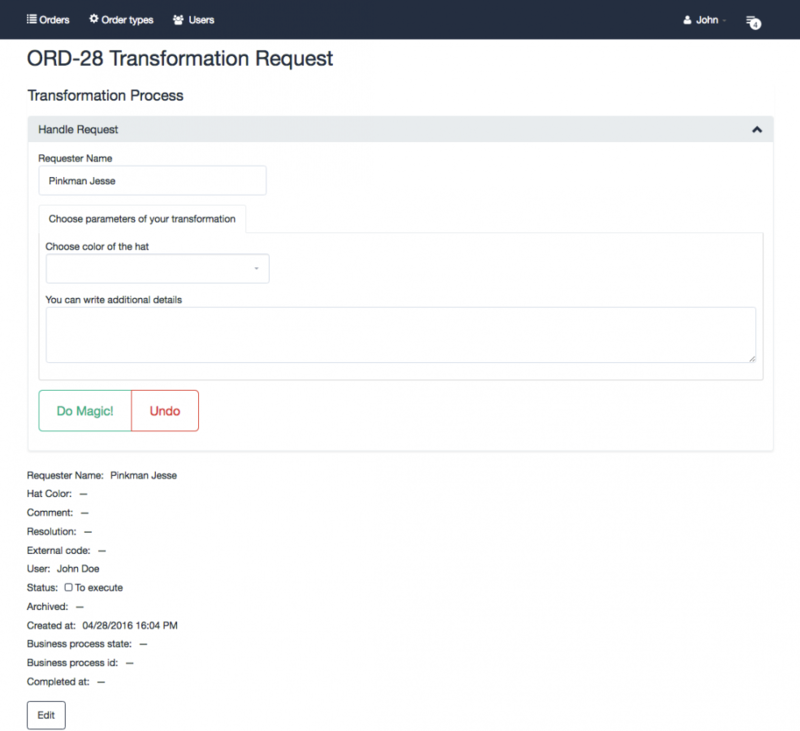 This business process has the transformationRequestProcess code (used in the BPM widget configuration file hbw.yml) and the Transformation Request name. The process of business process diagram creation and configuration is described below. 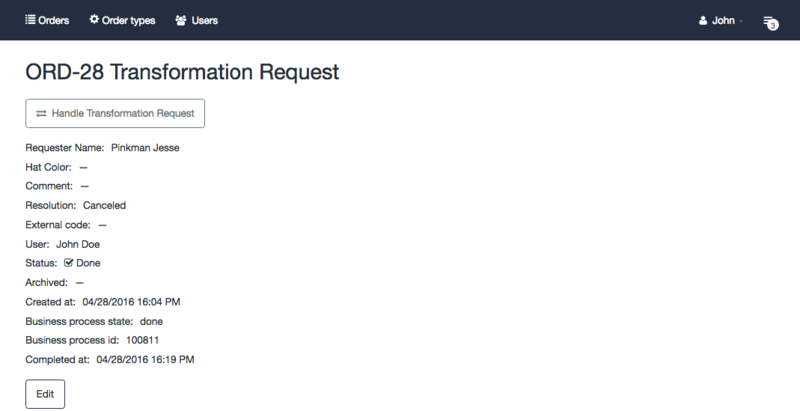 Now we are going to define the Handle Request task form configuration as described in the User Task Forms Configuration in the BPM Widget section. This form contains: customer name field, query fields group and decision making buttons. 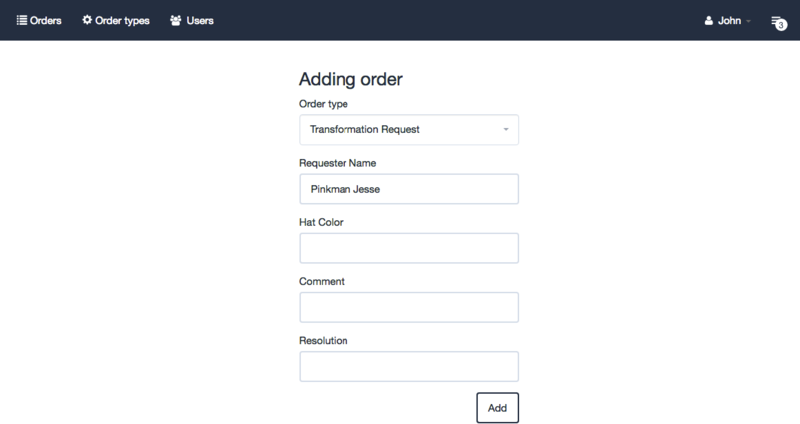 The BPM widget form field names correspond to the names specified in the transformation_request order type configuration. Thus, the prefix homsOrderData is added to the names in the lowerCamelCase style. The homsOrderDataRequesterName customer name field is stored in the string type. 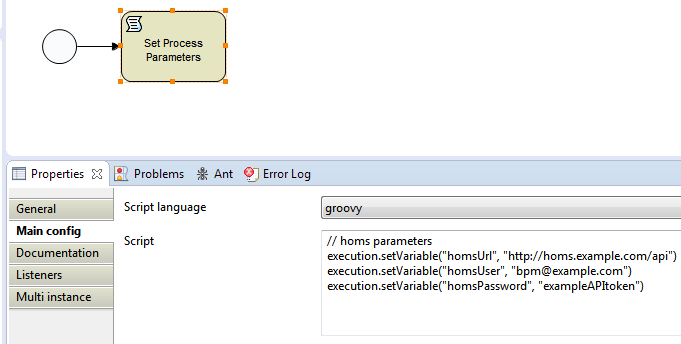 The group parameters has two fields: homsOrderDataHatColor and homsOrderDataComment. The first one is intended for the hat color selection (red or green) and is stored in the select type. Since the choice is mandatory, empty field is prohibited (nullable: false). Here we use the text type field with three rows for entering additional wishes in homsOrderDataComment. 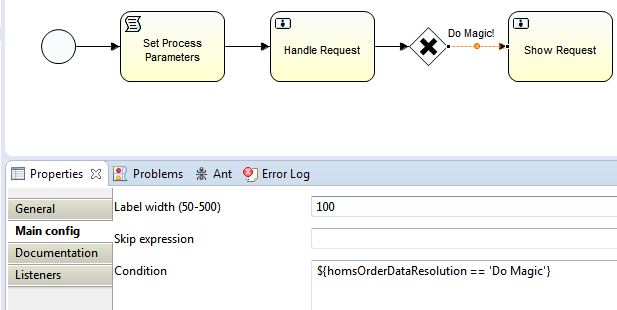 Once order fields are filled in, the request can be accepted or rejected with the homsOrderDataResolution buttons of the submit_select type. This type allows simultaneous form and button values submitting. Both choices are described in the options attribute by specifying displayed name (name) and value (value). The value is recorded in the order field named Resolution (described in the order type configuration) on the appropriate button click: Do Magic! or Cancel Request. CSS classes essential (by css_class attributes) to display order fields correctly are applied within the Handle Request task. 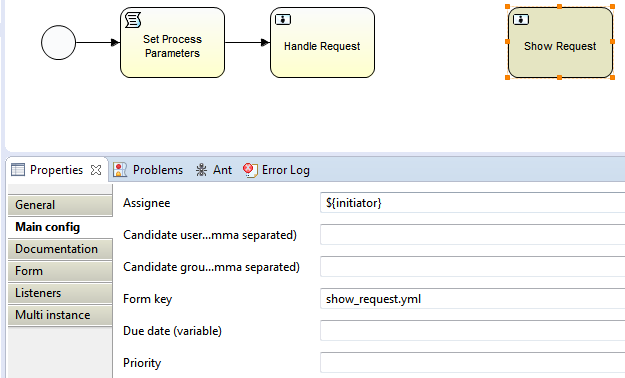 Similarly, Show Request task will be assigned to the initiator of the process, while the configuration with the form definition will be set up in the show_request.yml file. The standard Submit button is added automatically as there are no buttons described in this configuration. Click on this button to go to the next step of the business process (i. e. completion). The branching is added by the excluding gateway that allows you to select one of the options: to accept or reject the request. If the user chooses to click the Do Magic! button in the Handle Request step its value is recorded in the Resolution order field (as specified in the configuration file handle_request.yml). The business process goes to the Show Request task. If the user clicks the Cancel Request button the Canceled value is recorded in the Resolution order field. It’s recognizsed by the BPM system as business process completion criteria. Once the business process diagram is established with the all necessary settings and the configuration files of user task forms are prepared, you need to upload them to the BPM system to start order processing. 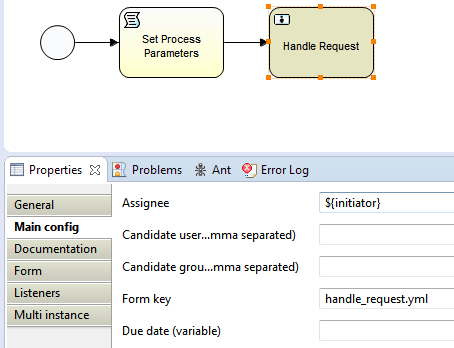 You should add the TransformationRequestProcess.bpmn file (business process diagram created in the Eclipse IDE), handle_request.yml file and show_request.yml file in a single ZIP -file and upload it to the Deployments section of the BPM system. 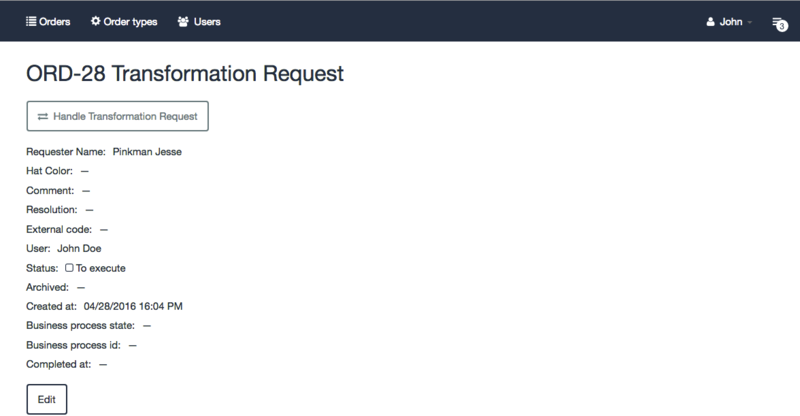 In this example transformation_request — is the code of order type; user@example.com, user@example.com, exampleAPItoken — email and API token for the user of the Hydra OMS and the BPM system; http://homs.example.com/api/orders — order processing API URL. You can specify a custom order field in the data block, in this case — the name of the customer, Pinkman Jesse. Here is the documentation for the Hydra OMS API: http://hydra-oms.com/api/. The date of the business process completion is set in the Completed at field. The Resolution field stores the Cancelled value so the Hat Color field and Comment field are empty. 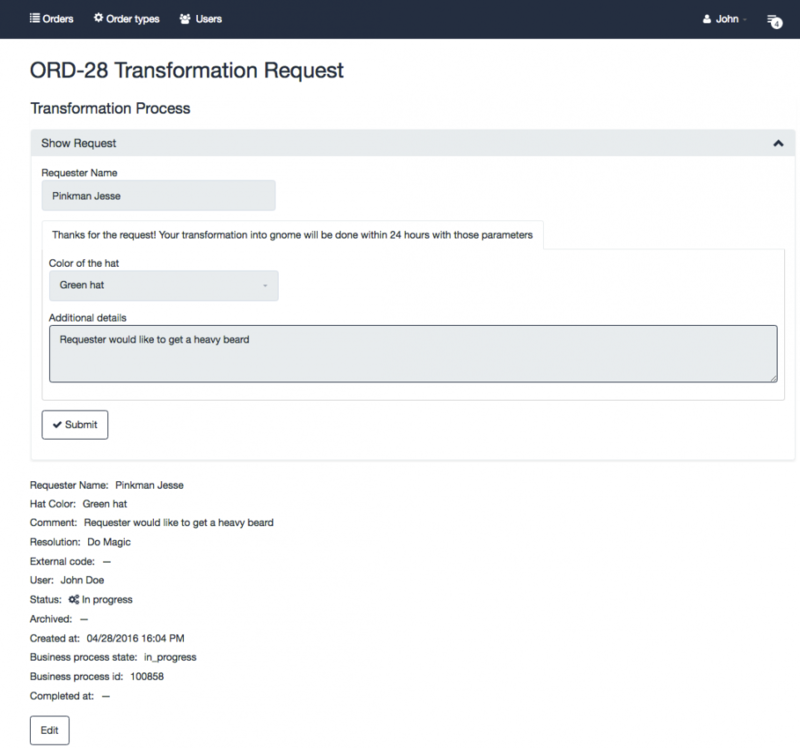 To re-start the business process, you should click the Handle Transformation Request button. To make changes to the order manually use the Edit button. Let’s re-start the process and take a look at the alternative outcome. Assume that our customer is ready to be transformed into a dwarf. He prefers the green hat and would like to have a thick beard after the transformation. In this case, choose the Green hat in the Choose color of the hat field and write a corresponding comment in the Comment field. Click the Do Magic! button and follow to the next stage of the business process. 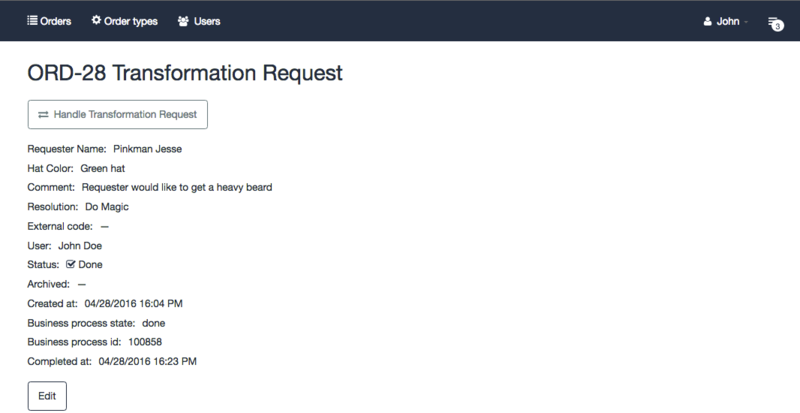 The request is accepted, it is reported in the BPM widget form and all details are recorded in the order fields (Hat Color, Comment, and Resolution). Complete the process by clicking the Submit button.